ALL ITEMS SOLD AS SEEN (AVAILABLE TO VIEW IN DUBLIN 18 SHOWROOMS). 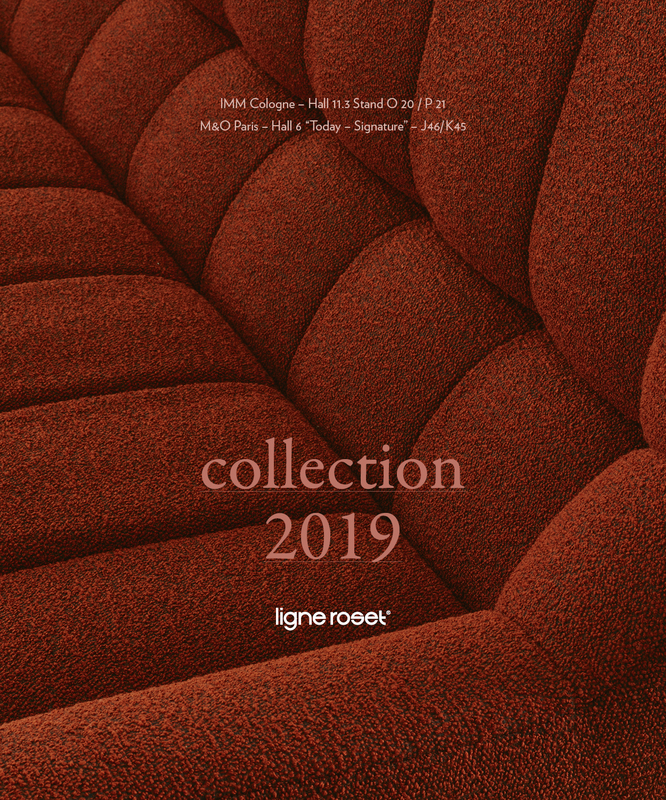 Join us in Paris & Cologne to view the new Ligne Roset collection 2019 . The tasks they had set themselves were: How can the front appear even more streamlined and delicate? How can the grip become even more comfortable, with a unique design? 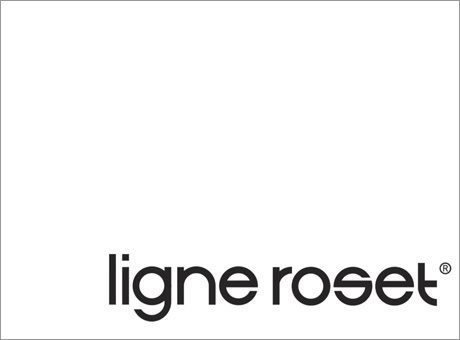 The result is a concept that reinforces the company‘s decades-long leading position in international kitchen design. The central design detail is the completely redeveloped SieMatic recessed grip channel: decisive simplicity on the outside, and a complex interplay of technical ingenuity, craftsmanship and superior materials on the inside. This innovation was only made possible by the perfect angle, the ideal feel and an individually controllable lighting system – the LED light strip integrated into the shadow gap. This innovative recessed grip is the basis of an intelligent overall concept that combines three design elements: Transparency, light and three-dimensionality. The result is a design that will once again be formative not only for the SieMatic PURE style collection, but for an entire generation of kitchens. The “New Handle-Free SieMatic” will be presented to an international trade audience at SieMatic Forum 2018 from September 15 to 20 at the “August-Wilhelm Siekmann-Forum” in Löhne, East Westphalia. It will be available in stores starting in 2019, the year in which SieMatic celebrates its 90th anniversary. 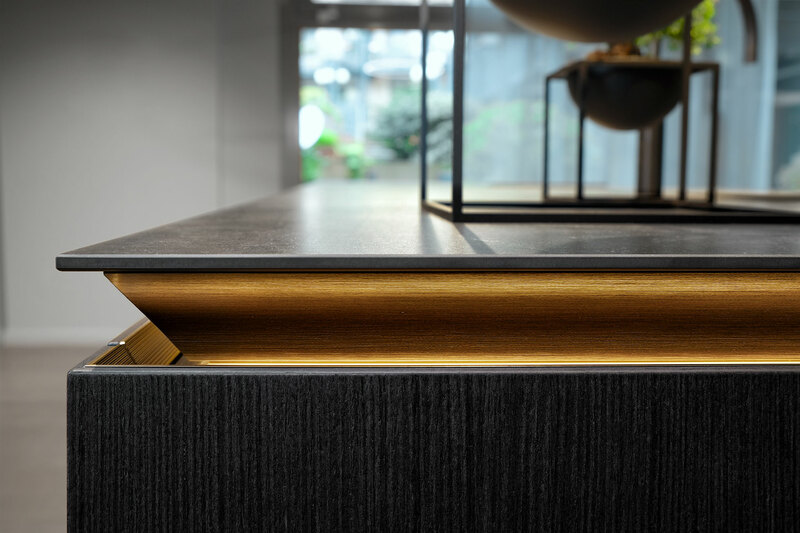 The central design detail of the “New Handle-Free SieMatic” is the completely redeveloped recess channel, which is not only a tactile experience but a visual one as well. 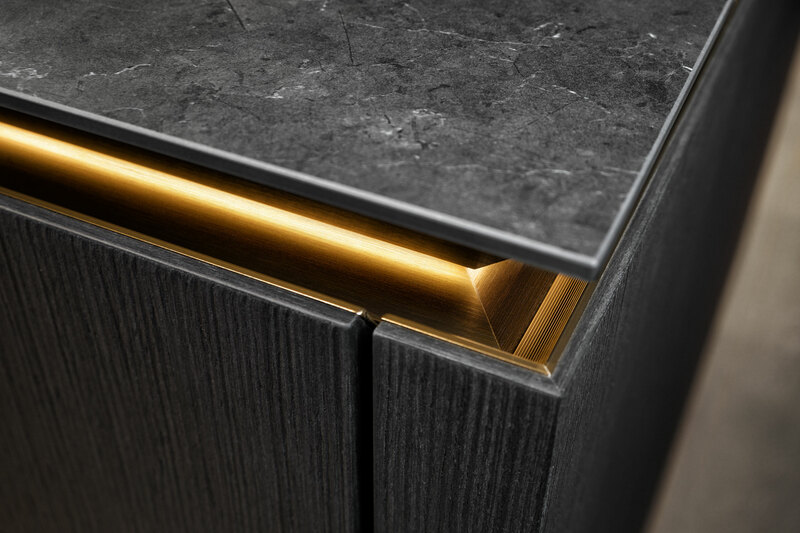 The unique effect of individually controllable LED lighting, which is discreetly integrated into the shadows of horizontal and vertical recess channels, makes furniture evoke a jewelry showcase. Another characteristic feature of the new SieMatic kitchen concept in the PURE style collection are generously sized, tinted glass surfaces used in conjunction with refined lighting integrated into cabinetry as a design element. 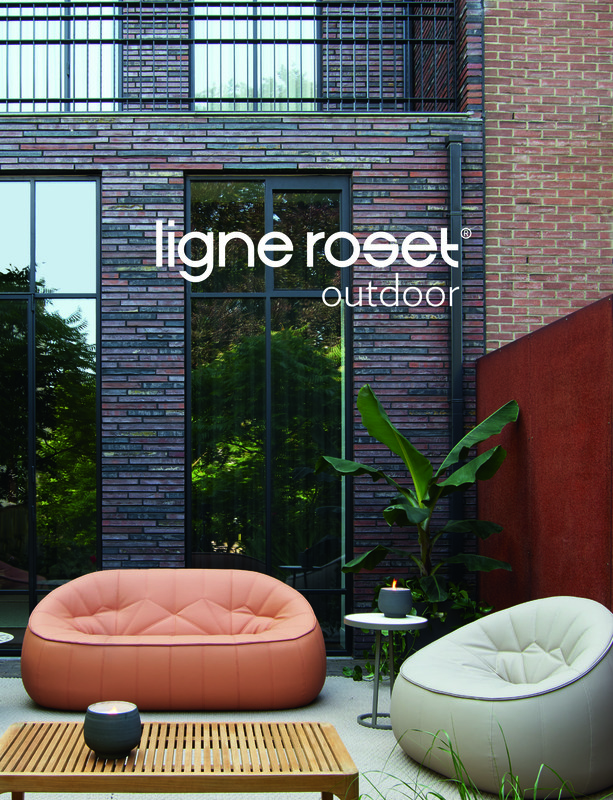 This interplay creates the impression of elegant transparency and comfortable lightness. Numerous options for kitchens and room design concepts of timeless elegance. 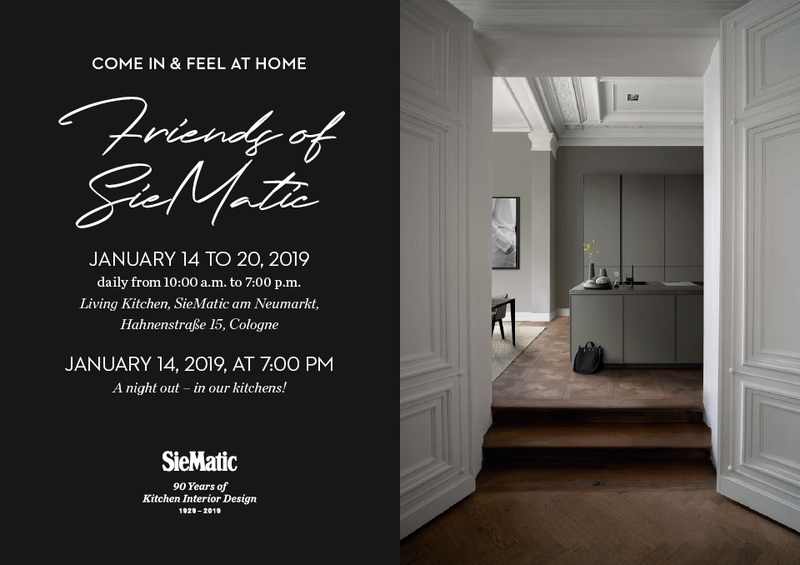 The new purist design concept will be shown in six completely different, livable design variations in the completely redesigned SieMatic exhibition. 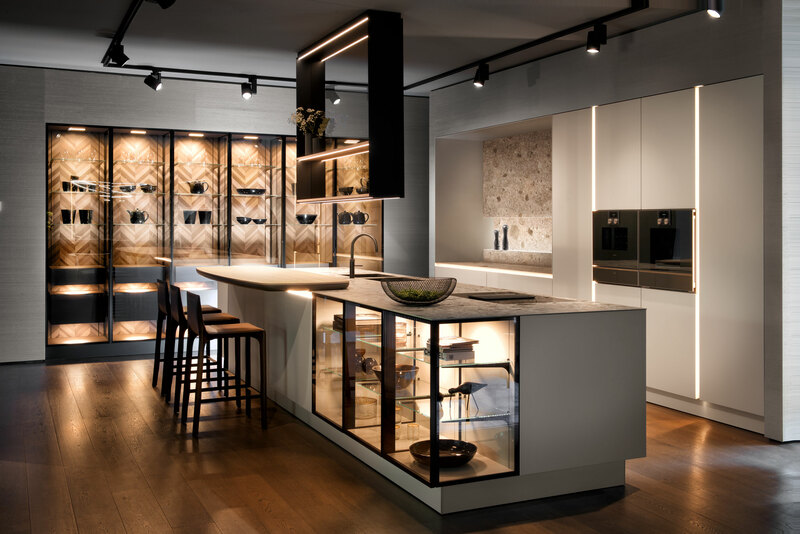 One shows a graphically austere composition of elements in sterling grey matte lacquer with SieMatic AntiPrint finish, coarsely textured ceramic, and black matte brushed aluminum – visually united by a wall of illuminated tall glass cabinet showcases. 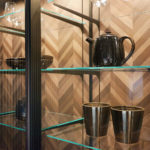 When the light is on behind the grey-tinted glass of the display cabinets, the back wall is a work of art, with a new, unique, genuine wood veneer with a finely crafted herringbone structure, inspired by classically laid parquet, but with a new, minimalist interpretation. Individually arranged, suspended veneer boxes on the back wall with drawers and pull-outs as well as glass shelves present objects and kitchen utensils. The cabinet interior becomes a stage. At the center of the design is a large, monolithic island, whose dominant character is softened by numerous details. Illuminated base cabinet display cases with matte black, brushed metal frames give the island a pleasant transparency. Their glossy, sterling grey interior finish harmonizes with the design of the cooking area. 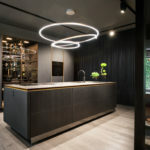 However, the severity of the design language and materials is deliberately interrupted with a warm accent: a bar counter with an elliptical curve and light wood surface mounted on a thin ceramic countertop. A second design example elegantly contrasts transparent tall glass cabinets with veneered, closed elements. Metallic design details connect recessed grip channels and glass doors. 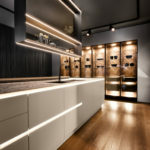 Lighting that can be changed according to mood sets apart surprising and effective accents of tinted glass tall cabinets, revealing the precious interior materials: a combination of high-quality, real-wood veneer, aluminum, glass, and mirrors. The surfaces are visually split up, creating playful, shifting levels and the impression of multi-dimensions. The asymmetrical composition of elements also brings excitement to the minimalist kitchen design, which focuses on the island as a dominant feature. The mirrored toe kicks give it a light appearance despite its volume. The band of light within the recess channel in shimmering golden bronze aluminum makes the delicate yet spacious, marbled ceramic countertop seem to float. Each of the three SieMatic style collections PURE, URBAN and CLASSIC presents its own coherent, contemporary life philosophy, which is expressed not only in furniture, colors or materials, but in holistic spatial design concepts that reflect the personality and individual lifestyle of their homeowners. Tranquility, harmony, and streamlining to the essentials distinguish the SieMatic style collection PURE, characterized by room designs in which kitchen functions are perfectly and discreetly integrated into the architecture. 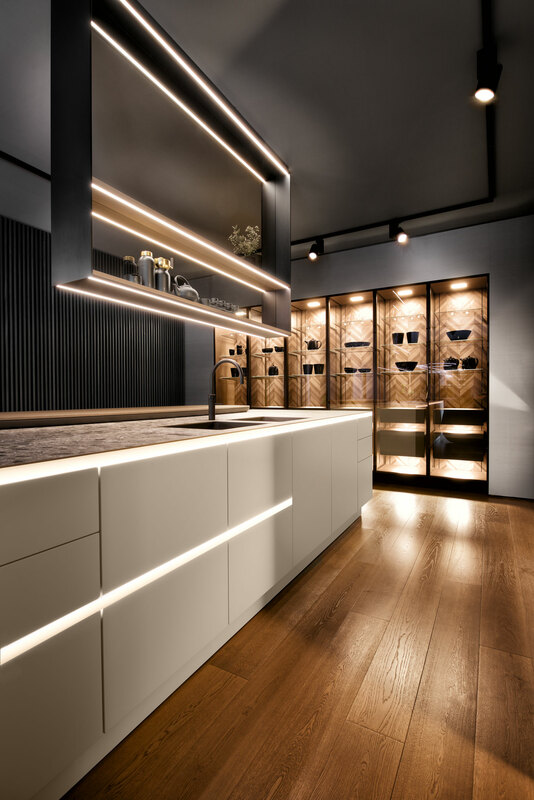 The elegant, minimalist furniture style emphasizes the lasting quality of the chosen materials and their precise workmanship down to the smallest detail – whether noble wood, precious stone, shimmering metal, high-quality laminate, exclusive lacquer or SieMatic SimiLaque. 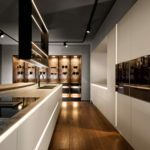 The intuitive juxtaposition of carefully selected, seemingly discordant objects speaks to the desires of a mobile, social generation: “Do it yourself – do it together.” Flexible, “solitaire” design plays just as important a role in the SieMatic URBAN style collection as the mix of open and closed furniture. Accessories such as the herb garden set “green” accents and bring nature into city apartments. SieMatic 29 is a signature piece of the urban collection: a reinterpretation of the classic sideboard that has already won a number of international design awards for its functional as well as emotional qualities. The room design concepts for the SieMatic style collection CLASSIC offer options that go far beyond traditional kitchen design. They make it possible to play with styles and combine the characteristic classical love of detail with modern clarity. 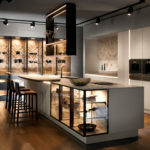 The creative mix of materials decisively influenced by the U.S. designer Mick De Giulio creates brilliant accents of glass and metal for designing highly individual, modern compositions of the classic kitchen. 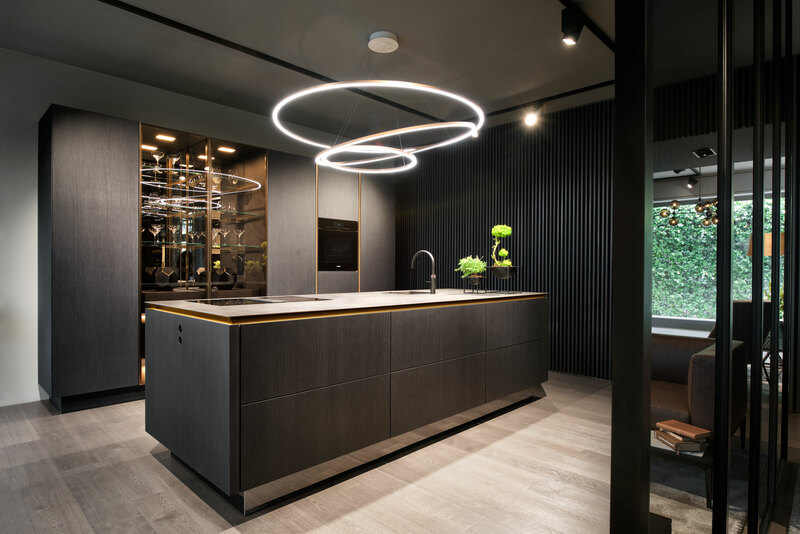 01 At the center of the design is the large island, whose monolithic character is softened by the transparency of the illuminated glass base cabinet s with black matte brushed metal frames. 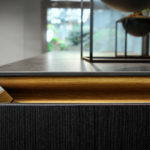 A warm accent breaks through the austerity of the formal design language and materials: the bar counter with its elliptical curve and its light wood surface mounted on the thin ceramic worktop. 02 This composition of elements in sterling grey matte lacquer, coarsely textured ceramic and black matte brushed aluminum, visually united by a wall of illuminated, glass tall cabinets, is characterized by graphic austerity. The illuminated recessed grip channels emphasize horizontal and vertical lines. 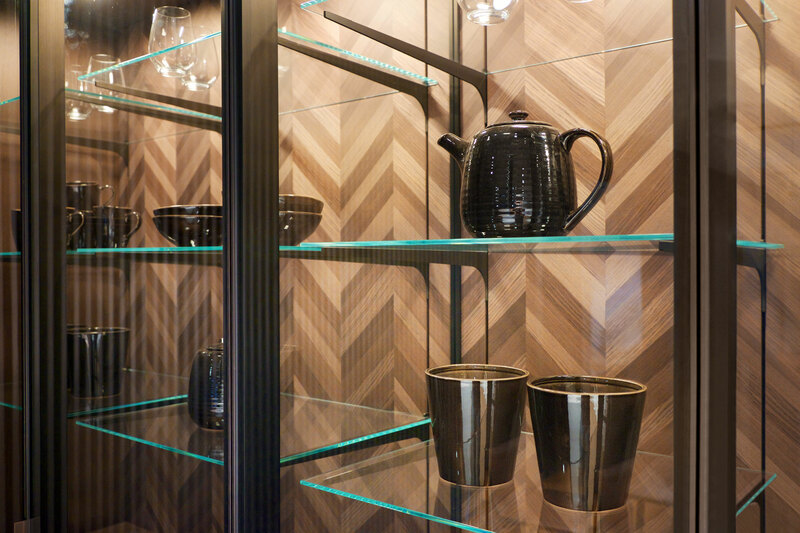 04 Behind the tinted glass of glass cabinets, the back wall in real wood veneer with finely crafted herringbone structure presents itself like a work of art when illuminated. 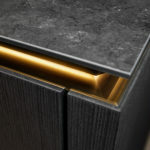 05 The parsol-bronze tinted glass doors of the tall cabinet showcases reveal the precious interior materials when lit: a combination of high-quality, real wood veneer, aluminum, glass, and mirrors. The visually divided surfaces play with changing levels and dimensions. 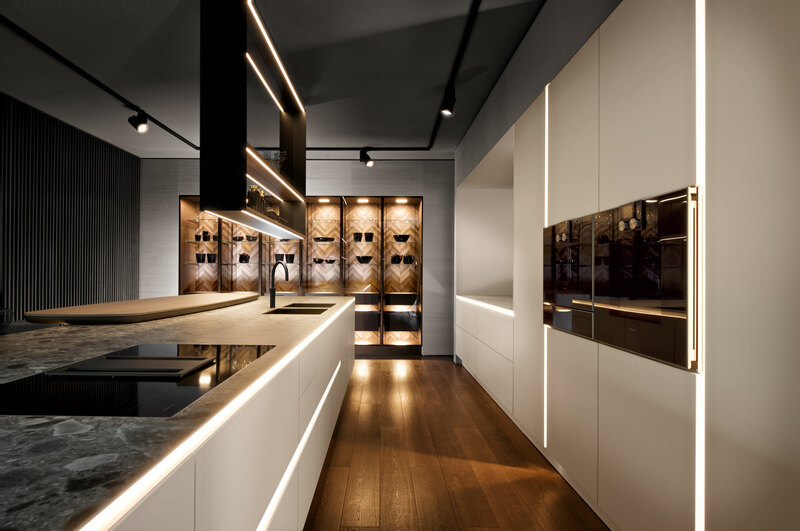 07 A unique feature is the individually controlled LED lighting system integrated into the shadows of completely redeveloped SieMatic recess channel, which makes the countertop visually floaty. We ask that you publish materials with reference to SieMatic as the copyright holder, with careful consideration to the brand name spelling. All text, information and materials are for editorial reporting only. Any commercial use – in particular advertising – is prohibited. More SieMatic press releases in German and English as well as downloadable images are available via the QR code below or at www.siematic.com/press.